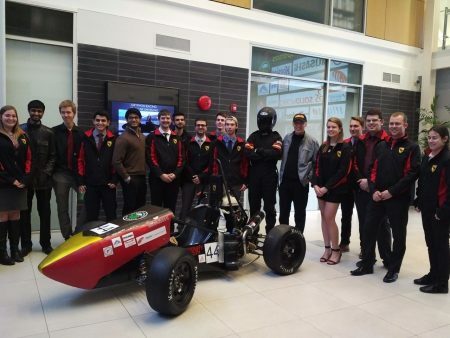 University of Guelph students are off to the races this week with their made-in-Guelph, high-performance race car. The Gryphon Racing Team will compete in the Formula SAE Michigan, an annual student design competition. The event includes 120 university and college teams worldwide, and will be held at the Michigan International Speedway. Before leaving, team members showed off their new entry to U of G president Franco Vaccarino and University staff, sponsors and supporters. Each year, the student-run Gryphon Racing Team designs and builds an open-wheeled, single-seat race car for SAE-sanctioned competitions. The team displays the car at events such as College Royal, GoEngGirl, National Engineering Month and the Royal Agricultural Winter Fair. Formula SAE events allow students to improve their engineering design and project management skills, and apply classroom theories. The race cars, which can reach speeds up to 130 kilometres an hour, are judged on design, construction, overall performance and cost. SAE International (previously known as the Society of Automotive Engineers) sponsors the events. About 30 U of G student volunteers have been working on the race car for the past several months.